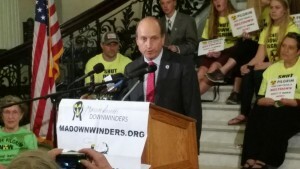 BOSTON – Members of the Pilgrim Nuclear Power Plant opposition group Cape Downwinders gathered with other activists and lawmakers Thursday in Boston, calling for an immediate closure of the Plymouth facility. Even though plant owner Entergy announced earlier this month that the plant would close no later than 2019, those who rallied inside the Statehouse demanded the company shut it down immediately, referring to a recent Nuclear Regulatory Commission report labeling Pilgrim as one of the most troubled nuclear plants in the country. “We are clearly in the most dangerous position we’ve ever been,” said Pilgrim Watch founder and director Mary Lampert. Cape Downwinders co-founder Diane Turco urged Gov. Charlie Baker to ask the NRC to immediately revoke Pilgrim’s license to operate. The activists note that federal nuclear inspectors in September said they were increasing their oversight of the plant following a January shutdown when an electric connection to the grid was interrupted. The protesters were joined by Cape and Islands State Senator Dan Wolf (D-Harwich) and State Senator Kathleen O’Connor Ives (D-Newburyport), who both said the 2019 deadline announced by the plant’s owner was not soon enough. Wolf cautioned the protesters about complacency now that a closure deadline has been announced, saying it’s really only a “10% victory.” O’Connor has been fighting to shut down the Seabrook Nuclear Power Plant in neighboring New Hampshire. A statement from the Nuclear Regulatory Commission said Entergy has committed to the agency that it will go through the review process, including inspections, and to make at changes required based on the outcomes. A couple dozen students and staff from Nauset Regional High School in Eastham joined the protest, sitting on the steps of the Grand Staircase, wearing bright yellow shirts with the “Shut Down Pilgrim” message. One student said she has lived her whole life worrying about the possible impact of a nuclear accident. Plant owner Entergy says the facility is safe but has become too expensive to run. Had the company decided to keep the plant open, Entergy would have been faced with the costs of additional federal safety inspections. An additional 1,500 to 3,000 hours of inspections and oversight as a result of the latest failed inspection and subsequent safety rating downgrade would be required, according to NRC Spokesman Neil Sheehan. The plant was re-licensed in 2012 for 20 years. The timing of the shutdown depends on several factors, including further discussion with ISO-New England, the operators of the region’s power grid. The closure is expected to have an economic impact on both Plymouth and the region. The plant is the largest taxpayer in the Town of Plymouth, paying about $10 million dollars per year, according to Plymouth-Barnstable State Senator Vinny deMacedo (R-Plymouth). Pilgrim provides about 10 to 15 percent of the region’s electric supply, according to Wolf. Entergy said the Plymouth plant generates 680 megawatts of power, enough to power 600,000 homes. The facility went online in 1972.